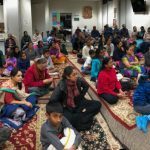 By benign grace of divinity and sheer compassion of Sadguru the devotees of bay-area were blessed with a great opportunity in an auspicious precinct to reminisce few things are that above daily trifles. 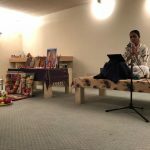 Sri Ramanujamji’s bay-area programs started with an enthralling lecture series on Ancient Wisdom for Modern Times at the Sanatan Dharma Kendra in Sunnyvale California.The first’s day lecture was on “Guru, The Kalpataru and Beyond”. On the second day, he talked about “Day by Day Spiritual Living” and on the final day, he lectured on “Power of Divine name”. Guru showers his unconditional love on his devotees. His love and care is a combination of the blind love that a mother showers along with the careful love of the father mixed which is mixed with a little bit of strictness. He provides guidance and finally shows from his own experience the destination that one should seek to attain. It is said that “Matha Pitha Guru Deivam” in which the journey starts with the motherly love of a guru, it then firms up with the fatherly love and then he shows the light and finally he reveals that he himself is the light. It is a guru who can absolve one from ego and fondle one by bestowing satsangs with his love and compassion and thereby make one oblivious to the pain of letting go one’s ego. He very beautifully elucidated the fact that when people go to a real personification of divinity, their ego starts to shiver and shudder. The guru is neither intimating nor showing his divine attributes but the moment we are in the vicinity of a guru, the ego very well knows that it is time for it to go. This is akin to an elephant dreaming about a lion in its sleep state and suddenly wakes up from the sleep with a startle. Life starts only when the ego is completely destroyed. He says Viveka is discrimination. It is verily making the right choices in life. Without satsangs and joint introspection with positive minded people, discrimination doesn’t come in very easily. Why is it that the process of making a choice is very cumbersome? It is because of the conditioning of the mind, what we think as freewill is not really free will. In-fact any will we want to exert to make a choice, is actually snatching one’s freedom. Swami Vivekananda says there is no term called freewill. The moment we want to choose something and exert the will, this will is not acting as an independent agency, but it is a sum accumulation of all our experiences, paradigms of one’s knowledge in the past and hence it is not free. If one student is well recognized in a university, that student has good thoughts about that university and recommends that university to other people. This is because of the past experience. When we keep holding the life based on the past, one cannot expect any new thing to happen in the future. Unless one for sees the danger of past condition of the mind which is forcing to make choices and that which goes by the label of freewill, it is not possible for one to even contemplate or even be aware of a leading a better life. Life is something that needs to be lived in happiness, with inner quality and clarity. The little spark that takes the future to be in a different plane from the past is called as Inner Transformation. 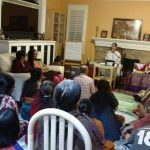 Tulsidasji says it is not accident that one is blessed with a satsang but it is only by divine providence that we get a chance to be in satsang. He very beautifully elucidated that Purana is not ancient truth. Pura means old and nava means new. Purana means living books. Truth can never be ancient and instead it is timeless. Srimad Bhagavatham was a wonderful science of living. It talks about modern concepts. It says unless we get something that is external to us, our notion and paradigms can never be changed. This is akin to Newton’s second law. Anything that is beyond the scope of our mind is treated as divine, or in other words, anything that is deeper than mind is divine. A problem in one level cannot be treated in the same level as it was created. It requires a subtler level as an elixir. Intelligence is identifying the cause of the problem and it brings in unseen links. As said earlier, when we keep holding the life based on the past, one cannot expect any new thing to happen in the future. But we still “HOPE” that something different will happen. However Srimad Bhagavatham paints a dark picture on the term hope. Belief is the first step and experience is the last step in spirituality. Srimad Bhagavatham says in order to get into spirituality, our past thinking and patterns needs a break. A newer thought process needs to spring up in one and that can be achieved only with a satsang. If satsang is encouraging to help in thinking beyond the daily trifles, then it is verily a satsang. It is very nice to see the meaning of the word satsang. Sang is association and sat is truth/good. Being connected to truth is satsang. Satsang is to bring one’s positive qualities into limelight so that there is mutual reinforcement. Patterns or ignorance are synonyms to darkness in our shastras. He lucidly explained the meaning of “jagat”. Jagat is something that is in flux always. Hence the whole universe is called Jagat. Guru is one who dispels darkness. Darkness is verily the mechanistic cause and effect that is plaguing one’s mind. Satsangs make one responsive to life and instead not react to the past. “Bhakti bikshai iyavae” – Please grant me alms of bhakti. The unsatisfied nature of the devotees is a virtuous loop and this loop of bhakti and devotion to the Lord will lead to more and more happiness in the journey towards moksha. The devotees of the Lord have no satisfaction even when reading Srimad Bhagavatham and by attending satsangs. 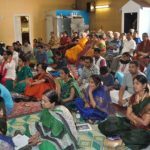 The devotees of the Lord normally enjoy listening to the stories of the Lord [shrunvanti], singing the divine names of the Lord [gayanthi], repeating and remembering the divine names of the Lord [grunanthi]. This is the exact definition of the term bhakti. There is no limit to bhakti and devotion. If we are far apart from Lord Krishna avatar, we are considered to be very fortunate. It is only then can we enjoy the bhakti and devotion that the other devotees had for Lord Krishna. They are always immersed in the experience of the divine. Doing worship without satsangs won’t make any sense. The passion for the Lord is kindled in satsangs thus making every act of devotion and bhakti holy. Satsang will expand one beyond that individual, his family and will make us aware that we are far more than all these definitions of self. In that expansion we experience happiness. When we start defining our own self in a more and broader way, happiness also increases since our ego is now divided. Any spiritual path is a panacea to get rid of one’s ego. Mahatmas transcend into the earth to show us a simple path for spirituality. Srimad Bhagavatham advises one to live a life with happiness, true love and gratitude to divinity. We can paraphrase the four milstones “Kaama Artha Dharma and Moksha” for the devotees of the Lord in a different way. For an ardent devotee of Lord Krishna, Kaama is to perform intense seva to Lord Krishna. Artha is rathna [jewel] of Lord Krishna. Service to the Lord is verily dharma and to be in the service of the Lord eternally is moksha. The sound of the mantra has the power to make a visible change in the mind by awakening the mind and the body and brings in the force of being in onself. That is why they are called Maha mantras. Some mantras have bijaksharas and they have to be dealt very carefully. 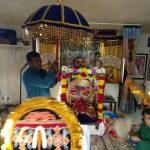 Mantras which have the letter ‘naam’ in it like Namashivaya, Saravanbhava, Rama are called Nama mantras and are devoid of any conditions and dangers. It is like a child crying out to its mother. It is the chanting of these names that can lead us into the state of true love and higher state of spiritual awakening. The true spiritual awakening state is a triangle and the three sides are Asthi, baadi and priya which translates to existence, knowledge and love. This very much means Sath chith and Ananda. When one chants the Mahamantra mentally, Sath and chith are combined and when we are established in that highest state then it ushers one into bliss [ananda]. The Mahamantra encompasses anything that is divine. Anything that is said to be complete has sixteen elements [shodasha] in it. The Mahamantra has sixteen words in it and it is said to be poorna mantra. The satsang ended by chanting Mahamantra eleven times. About 50 devotees each day were fortunate to drink these nectarine droplets.